Next to improving your riding skills, the suspension is probably the most important or easiest and most cost effective way to increase your speed on the trail or track. In the coming articles I will go in-depth on the different designs and types of suspensions as well as some theory and tuning tips, but in this primer I will discuss the most important thing you should do before even trying to tune your suspension. Maintenance! Before you can effectively tune any suspension on any machine you need it to be in near perfect condition. If you have never disassembled any part of your machines suspension since you have owned the machine, chances are its well over due. Neglecting the maintenance on the items that keep the wheels (and ultimately the power) to the ground can cause costly repairs down the road, not to mention a poorly handling machine. Its best to start from the front and work to the rear. Jack or lift your machine so that the wheels are off the ground. Take each front wheel and check for excessive play in the wheel bearings by grabbing the wheel at 12 and 6 o’clock and try to rock the rim/tire back and forth. Watch and feel the bearing for any play. Most wheel bearings on ATVs are non serviceable meaning if you feel any play you cannot adjust the pre-load nor grease them, thus replacement is the only option. Repeat for the other side. Next focus on the a-arm(s) ,depending on the type of front suspension you have, check all mounting points and bushings (or bearings) for play. Some models have grease zerks but most do not. If your model does not you will need to disassemble the a-arms and put some waterproof grease in the bushings (or bearings). Again excessive play warrants replacement as it is cheaper to replace an inexpensive bushing that letting it wear through the bushing into the steel of the arm itself. On McPherson strut type machines you will want to pay close attention to the top mounting stud to be sure the nut is tight and the rubber bushings are in good shape. Depending on the type and design you will want to look at some of the similar things as the front suspension. The carrier bearing is probably the most expensive wear item on a swing arm machine, not to mention its the hardest to replace, so keep an eye on it so you don’t ruin your swing arm. 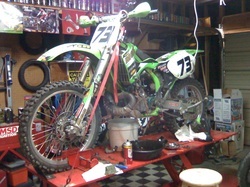 Swing arm and the shock linkage bearings should come next. A quick way to check to see if they are worn or the bolts need tightening is to lift up on the grab bar while the tires are on the ground. It might be helpful to have a friend do this as you watch around the bearing mounting flanges and the linkage areas for play. While lifting up slowly you might even be able to feel the play all the way back at the grab bar. The rear suspension is a place that many riders neglect and when its worn out it can cause damage to more expensive parts. Rebuild kits are inexpensive and for the most part easy to install with basic hand tools. If there is little or no play a good cleaning and re-greasing should be an annual maintenance item. On IRS type machines the same type of checks should be performed as on the front. Another area to take a look at is the lower and upper shock mounts. On some types of shocks there are grease-able bearings others use bushings, use the same judgment and replace as necessary. If your trying to remove the old bearings from the linkage block (on a link-aged type swing arm) and they are being stubborn. Use an inexpensive arbor press use a socket just small enough to fit inside the bore and press the old bearings out. A large bench vise can be used as well with some creativity. If neither of those are available, find a welding or machine shop, they usually have different presses and may do it for a nominal fee. If your machine did not come with grease zerks on the a-arm bushings install some yourself. This can be kind of involved but basically drill and tap a hole for a standard zerk. This will require a full disassemble. Water-proof marine grease works well for suspension parts, although some atv/motorcycle specific greases are available as well. The time you take now can keep you from having to replace expensive parts later. Also getting your suspension mounting points in tip top shape will get you ready for future articles when I go in depth into the other workings of the suspension. I will take each subject separate as there is a lot of material to cover, so stay tuned!